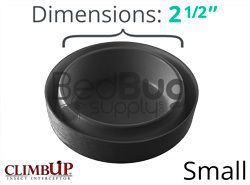 Climbup Insect Interceptors are a unique and easy-to-use monitoring system to aid in the early detection of bed bug infestations. These specially designed plastic cups are pesticide-free with polished walls that are too slick for the bugs to crawl out. 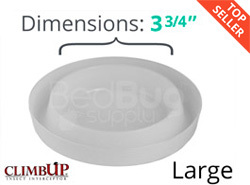 Bugs approaching the bed (or other furniture) from the floor will fall into the outer well while bed bugs leaving the bed will be captured in the center well. 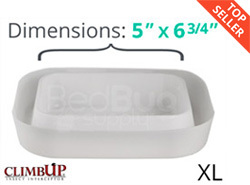 The ClimbUP T can be used to detect bed bugs in an unoccupied room with a CO2 Tank, or an insulated beverage cooler of dry ice, in the center well, or in an occupied room under very large furniture legs. The exterior climbing surface of Climbup T is black paper. The center well's diameter is 5 3/4". Climbup XL Insect Interceptors are the largest version of Climbup Insect Interceptors. These specially designed plastic cups are pesticide-free with polished walls that are too slick for the bugs to crawl out. 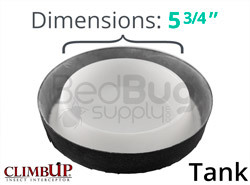 Bugs approaching the bed (or other furniture) from the floor will fall into the outer well while bed bugs leaving the bed will be captured in the center well. Inside dimensions are 5" x 6 3/4"